Second Life offers an abundance of amazing locations for great shoots. Yet optimizing the lighting for an on-location shoot can be challenging, which is one reason why many SL photographers opt for studio shooting. I recently took Ananke Media Systems‘ PhotoLite toolkit to the beach to see how this highly versatile system can enhance the look of images you capture inworld. This first photo shows our lovely model (none other than moi – of course!) posing on the beach with the existing night lighting. Nice location – what you can see of it! Here’s the same location with lighting and effects added from the PhotoLite toolkit. I’ve used lights to brighten certain elements in the background (the pampas grass and palms) as well as the model (isn’t she gorgeous? — okay, I’ll stop). I’ve also added a very light mist with two effects generators to soften the reflected light from the sand and provide another colour detail. After hiding all the lights, effect generators and the pose stand with a couple of quick clicks on the PhotoLite HUD or menus, the scene becomes a vivid yet still natural looking setting perfect for capturing the romance of LeeZu Baxter’s Noir line! 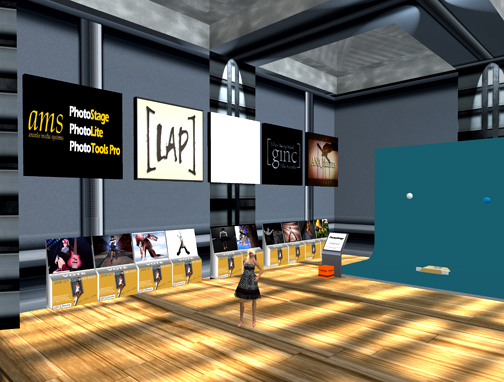 Ananke Media Systems (AMS) has teamed up with the 2008 SL Footwear Expo to offer PhotoTools Pro as part of the Grand Prize in the Flickr Footwear Contest. A demo of the PhotoStage is now on display in the Contest Voting Station at the Expo. You can read about all the prizes and rules at the official Footwear Expo website. Lots of great prizes and already plenty of amazing footwear photos to satisfy even the most ardent footwear fetish! Be sure to visit the Flickr site to check out all the photos entered in the Footwear Contest! The Footwear Expo runs now to July 27th. Lots to see and do. Everyone’s there! Don’t miss it! Ananke Media Systems announces the opening of a second PhotoStage display site in the new store at Metro Models. AMS is delighted to be the first company chosen by the Metro Models Agency to set up shop in their glamorous new headquarters. 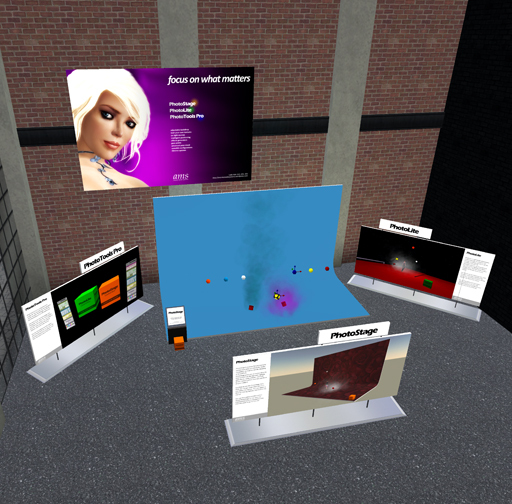 Agency Director Alaska Metropolitan has been a strong supporter of AMS from the beginning, participating in the beta testing of the PhotoStage and serving as one of the judges for the photo contest at our original Launch Event at Princeton University’s Alexander Beach sim. At the new Metro Models store customers can try out a demo of the PhotoStage, and purchase all three AMS products: PhotoStage, PhotoLite, and PhotoTools Pro. For more information about Metro Models, please be sure to visit the Metro Models website. Welcome to the new look for the AMS website. As announced in her recent post, Anna Tretiak has decided to leave AMS in order to pursue other RL interests. Her departure is amicable, yet necessary, and I’m sure all of you who know her in Second Life will join with me in wishing her the very best in her future endeavours. While Anna’s involvement in the company will be missed, it would be wrong to think AMS is now under new management. Anna and I created our business together and I have been actively engaged in its operations from the very beginning. Please be assured that AMS will continue to provide high quality products and excellent customer service. I hope you will like the fresh look of the new design scheme. All of the content from the old website is still here, and I will be continuing to update with new notices and information on a regular basis. After six months running Ananke Media Systems, I am off. I am leaving the business. My partner Serenity Mercier will be taking over from now on. Starting up and running AMS has been quite a ride. I have learned a lot, and made some money too. I would like to send a warm thank you to all our customers who have trusted us, and to all others who have liaised with us in so many ways. For me, this is over. Goodbye. Hugs. Kisses. Some tears. And good luck to Serenity. You be nice to her.